I have had my eye on the Brand Cult 51 for well over a year, it is not a brand that you see splattered across TV or magazines, it's one of those classy little minxes that just quietly sits there until you fall in love. I had read rave reviews from the beauty gods India Knight and Alexia Inge and wanted to know for myself what the hype was all about, the reasons I didn't immediately jump in and buy this were twofold the first one being that I have enough skincare in the office to sink a battleship ( yes I appreciate that I am blessed ) and secondly this stuff isn't the cheapest. That being said I dipped my toe in at the most expensive end with Cult 51 Immediate Effects Serum at £95.00 30ml. As you can imagine for someone with no actual need to buy a product this was a risk for me ! As my regular readers know I don't profess to be a beauty expert, I have no knowledge of Science other than being reprimanded for leaving a Bunson Burner left on in the Science Lab at school in the early 70s. But I do know what does and doesn't work on my very normal ageing skin. I did wonder if the Brand founder Richard Mears a self confessed science geek actually knew that this would become a cult product when naming the brand ? I will be speaking with him next week so will hopefully remember to ask him. You know when you have something that you really want to work but are not actually sure if it does ? or you are just convincing yourself that you haven't wasted your money and the hype is true ? and stare into the mirror almost wishing to see a difference ? Forget all of that, within 15 minutes of applying this magical formula to troubled areas ( my polite way of saying wrinkly bits ) you will start to see an improvement and within the hour you will be double taking in the mirror, as always, I have to be honest in that I prayed this wasn't a gimmick, I went to Pro Beauty a couple of years ago and was grabbed by a very loud woman who insisted on putting her very expensive miracle eye lift on me, great, it looked fab for 20 minutes when walking round the show my daughter suddenly exclaimed " Mum your eyes are flaking " imagine the horror ha ha, I grabbed a mirror and sure enough the product was flaking like dry egg white, which is probably all it was ! I first tried this serum on a day that I was at home, just in case ! 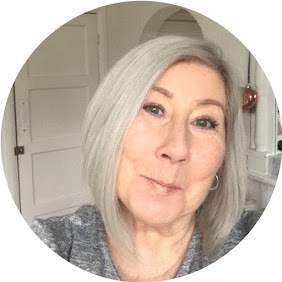 by the evening I wanted to go out somewhere nice I felt so flipping lovely, I actually really liked how my skin looked, it kept making me smile, yes it's expensive but so is Botox and you know what ? at this age you have spent your life putting everyone else first so why bloody not ! On using this daily, yup I have become addicted, the results just keep getting better, this is no quick fix, well it kind of is, but not a temporary quick fix, it works to make you instantly look and feel great and continues to deliver day after day. If you want the whole Science behind the product, please do read up on it on the Cult 51 Website here. This post would become a book if I attempted to explain it all, and as I say I am no scientist. I can with my hand on my heart say this Serum has made me feel great both visibly and from the feeling you get when you actually like your face. I will be back with a further post on Cult 51 as I can't stop just here with the brand. Post contains Brand/PR Samples unless otherwise stated, does contain AF link. I was intrigued to see your review. I had a bit of a gap between my first and second bottles of the serum (trying other things) but now I'm using it again I can see the difference. I get so fed up with the white flaky bits that most products give!